Based on reviews from 3 experts and 373 users. 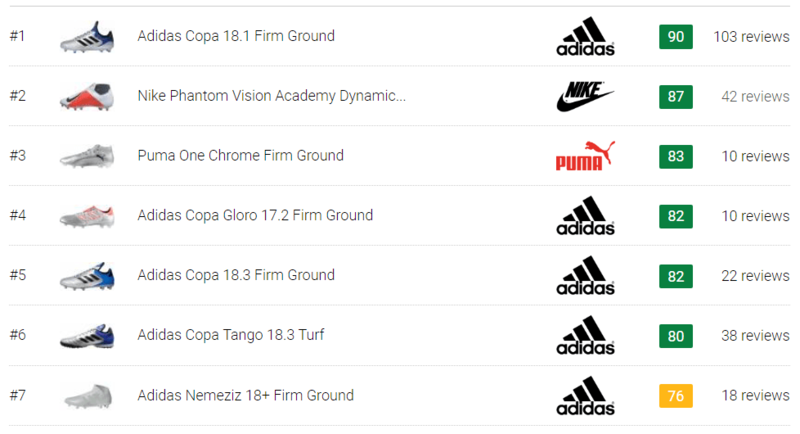 Learn how our rankings work or see our guide to silver football boots. Updated Apr 2019. When it comes to football boots, each player has their own style and their own opinion of what defines the perfect shoe. More often, the footwear choice of athletes reflects how they approach the game and says a lot about who they are on the playground. Since football players usually play in uniforms, they really only get to show off their personal style in their cleats. This is why it comes as no surprise that shoe manufacturers spend a good amount of time and effort in improving their cleat designs to fit the diverse preference of wearers. The current shoe market offers players a myriad of design and color choices, from the classic black and white to the latest hype of neon cleats. 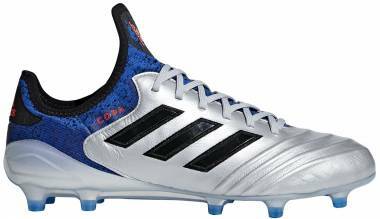 Silver football boots are among today’s popular color choices that athletes want to take to the pitch. They combine a bit of classy and flashy without overdoing it. They also present a regal appeal that best fits the royals who dominate the game both in looks and in skills. It wasn’t until the later part of the 1900s that football boots got a major makeover. Well at least, in terms of color and design, that is. With soccer cleats getting lighter, colorways also began to veer away from the classic black boots, that was the current trend during that time. During the 1970s, designers took risks in experimenting with different colors on soccer cleats. When Allan Ball first graced the pitch with a pair of Hummel boots that were white, not black, that marked the beginning of a new age in football shoe design. Different hues then came to spice things up, and it got players excited. Now, athletes had the option to wear colored cleats that matched their personality or their mood. They were able to express themselves and showcase their uniqueness through the choice of soccer shoes. Silver football boots best fit the resourceful and flexible athlete who welcomes new possibilities. As silver is a hue that gives off an optimistic and positive aura, it well represents team leaders who lift the morale of the group. 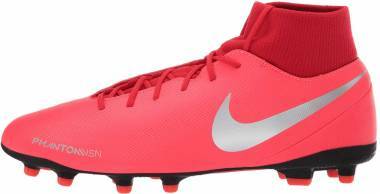 The color also offers light and balance that perfectly suits players who have the speed and balance to burn. Since colored cleats were first introduced on the pitch, shoe manufacturers have made it among their priorities to come up with boots that are not only functional but also stylish. In today’s soccer market, it isn’t unusual to see racks filled with all sorts of colorways. From subtle black and white combinations to louder hues of red and purple football boots, shoe enthusiasts are sure to find a match for them. Taking the indoor game to the next level is the turf version of the MagistaX Proximo II in a silver bullet colorway. This silver football boot highlights the brand’s dynamic fit collar and boasts of an impeccable fit owing to its FlyKnit upper. It also allows a premium touch of the ball that is sure to help wearers optimize their ball handling skills. Being among Nike’s top-tier creations, this cleat offers utmost comfort and incredible performance. It has even received a high level of praise for its design and features. Considered as one of the fastest boots of its time, the R9 edition of the famous Mercurial Vapor II is truly one boot to remember. It comes in many stylish colorways, including a Chrome Silver/ Blue version. Before the CR7, the R9 was the boot choice of Brazilian superstar, Ronaldo. This speed boot featured a super lightweight NikeSkin upper for agile performance and excellent ball touch and feel. It also incorporated a contoured glass-filled nylon structural soleplate with a Speedtrack configuration for unrivaled speed and acceleration. Hailing from another famous boot series, the Predator Pulse 2 TRX FG is the signature cleat of football star, David Beckham. The shoe showcases Adidas’ PowerPulse technology that boosts shooting power through relocated weight distribution. It also features the Traxion technology on its outsole that gives optimal stability when playing on firm ground surfaces. Additional features of this boot include its K-leather upper and its dual density external heel counter that serves to improve fit and comfort. 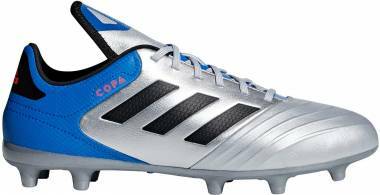 This football boot comes in a Dark Silver colorway, among many others. The Puma One Chrome is a limited-edition boot coming from the brand’s latest collection. It follows the design of the original Puma One 17.1 and is painted with a catchy silver color accented with blue depths. Being among Puma’s speed boots, it is engineered with a lightweight Pebax outsole and a stud configuration that delivers speed. It also utilizes an evoKnit sock for added comfort and a microfiber upper with a chrome effect for the ultimate touch and feel of the ball. Designed for the small-sided game, this silver football boot utilizes a geometrically-designed SprintFrame construction that grips well on hard surfaces. This cleat offers the perfect balance between lightweight and top quality stability. It also employs a women-specific micro-suede heel padding for a comfortable fit. This indoor cleat is available in a Metallic Silver/ Brick colorway. Coming from the family of the classic Tiempos, the Rio III wears a synthetic leather upper with breathable fabric lining. Its base is equipped with a lightweight TPU soleplate and rubber cleats that deliver the needed traction to dominate the pitch. The women’s version of this silver football boot comes in a Silver Purple colorway. This silver football boot wears a water-resistant leather upper fitted with an anti-stretch lining. It offers a consistent form-fitting fit that feels comfortable out of the box. For its outsole, this cleat is equipped with an Axeler sole that offers even flexibility and stability. Aesthetics wise, this Diadora cleat combines white, navy, and silver to make a unique and stunning colorway. Anyone who has ever played football as a kid could probably remember banging his pair of cleats against a hard surface to take the mud off the bottoms. The truth is, football is a tough sport, and it can be tougher on our shoes. Having to endure the changing weather conditions and tread through rough and muddy grounds can take its toll on our boots. Keeping one’s silver football boots fresh and clean should be a priority for every player. Each football boot is an investment, and like every investment, it needs our care and attention. Not only will it prolong the life of our cleats but also improve its performance on the pitch. Ever heard of the “shower technique” or the “hot water trick” as one way of breaking in new cleats? Some pros actually say that this method lets the leather loosen and expand, so it stretches for the perfect fit. Well, let us be the one to put an end to this myth. Doing this ruins the shoe, so we advise against soaking your cleats in water. An excellent way to preserve leather cleats is to polish it with cream so it won’t dry out. One thing to note though is that this tip is only applicable to natural leather shoes, which need conditioning to keep them soft. The cream also prevents cracks and stiffening of your leather shoes. The moment you step off the field, make sure to remove your silver football boots. It is never a good idea to use your cleats anywhere except on the grass of the pitch. Surfaces like asphalt, concrete and other hard surfaces can wear down the studs and render the cleat useless when it comes to traction and stability on the playground. Players know just how a well-worn pair of silver football boots can smell after a long workout. One good way to get the stinky smell off your cleats is to air them out. That means not keeping them inside your bag and allowing them to air out. This minimizes bacteria that is the cause of the unpleasant odor. If you clean your silver football boots right after you use them, dirt and grime won’t have the chance to sink into the material. This protects your cleats from damage caused by retained dirt. If you’re using leather cleats, you can head to the nearest sink right after the final whistle to wash off any mud off. Putting newspaper inside your silver football boots after washing helps soak up extra moisture. The stuffed paper also holds the shoes’ shape better as they dry. Aside from the football boots mentioned earlier, what other silver football boots are available from other shoe brands? 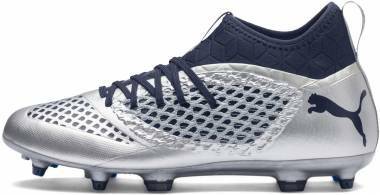 Under Armour actually offers their own silver football boots. One that stands out the most is the Under Armour Spotlight, Metallic Edition, which showcases a cool silver and black combination. This football cleat features the innovative Speedform construction that gives the perfect fit. Compared to the standard model of the Spotlight, this version is significantly lighter at 7.4 ounces. It is engineered with an unprecedented construction and a seamless molded heel cup for comfort and stability. What significant difference do silver football boots and grey football boots have? Silver and grey football boots are sometimes hard to distinguish, especially on the pitch. However, based on color psychology, the two hues do have a slight difference. With both colors displaying a balance between black and white, silver tends to be a more lively color. This is why it is also known to be the metallic gray as it shows off a more polished version of the said hue. Compared to gray which displays a more subtle aura, silver exudes a classy and appealing vibe similar to the popular metal, silver.